Do You Need Help in One of These Areas? Even when you do find time to hit the gym, regardless of having a schedule that’s full of work, family time, and other obligations, you might be bored by your same old workout. There’s nothing exciting about another go-round on the treadmill or elliptical – and you might need some encouragement to stick to a schedule and achieve your fitness goals. Finding The Time and Energy to Exercise Can Be Difficult! Q: Do I have to be in good shape to study Martial Arts? A: No. In fact, Martial Arts is one of the best workouts you can do to get in shape if you’re not happy with your current fitness level. It works your entire body. Over time, you can increase the intensity of your workouts to continue to challenge your body. Q: Will Martial Arts help me lose weight? A: Yes. However, it is important to combine Martial Arts with a healthy diet and lifestyle if you want your body to be lean and strong. Martial Arts burns a lot of calories but you may have problems if you eat a diet high in sugar and processed foods. Q: Is Martial Arts good for self-defense? A: Yes. Martial Arts teaches students to leverage their own body weight as well as their opponent’s weight. Students learn practical moves that are ideal for self-defense – and Martial Arts also builds good reflexes, which are essential in a fight. Q: Do people really study martial arts to make friends? A: Yes, it happens all the time. 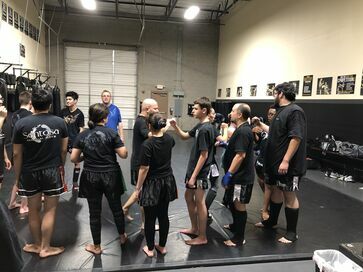 Everyone in the class has an interest in martial arts and fitness, and that gives people a good starting place to build new friendships. Q: I don’t think of myself as an athlete and I was never good at sports. Can I do martial arts? A : Yes. Martial arts instruction is tailored to each student’s capabilities and goals, so anybody – at any fitness level – can benefit from studying martial arts. Q: I do better with workouts when I have a friend with me. Can my friend and I take classes together? A: Yes, we love it when friends come in together. Working out together can help strengthen your friendship and help both of you meet new people, too. Q: I’ve always thought of myself as clumsy and un-athletic. Can martial arts make me more graceful? A: Yes. 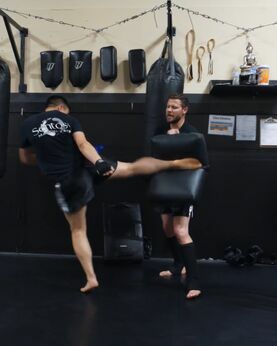 Martial arts instruction focuses on building core strength and improving balance. As you become more aware of your body and its capabilities, you will feel less clumsy. I have lost 75 pounds and I am in the best shape of my life since starting Muay Thai! My family and I love training here. Lots of fun and keeps my family active! 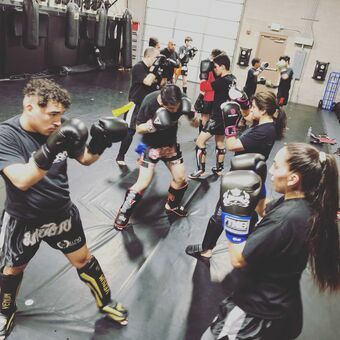 The training is awesome and I love the family environment where everyone here supports each other! Martial Arts Reduces Stress and Anxiety! Working out regularly releases feel-good hormones called endorphins. Martial Arts will help you maintain the proper hormonal balance so you can cope with stress as it arises. 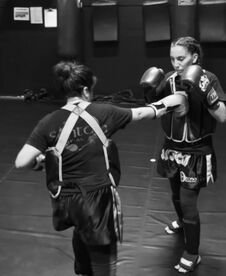 At the same time, Martial Arts can also make you feel better about yourself and your body, which contributes to good mental health and makes it less likely that stress will affect you. 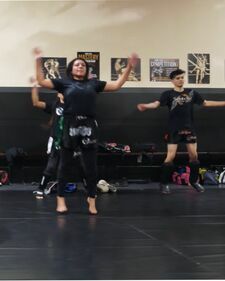 I have an extremely stressful job and Muay Thai helps me to relieve stress and feel more relaxed!